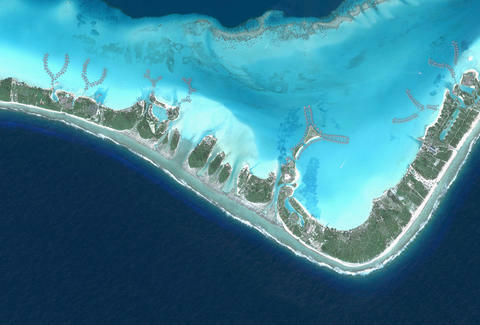 Bora Bora | Images copyright 2016 by DigitalGlobe, Inc.
Astronauts have a name for the profound sense of awe they feel when they gaze at the Earth from space: the overview effect. That shift in perspective can lead to a full-blown psychological shift, a deep appreciation for Earth's fragility and connectedness. See the world from far enough away, it seems, and we better understand what it is to be alive, to be human. 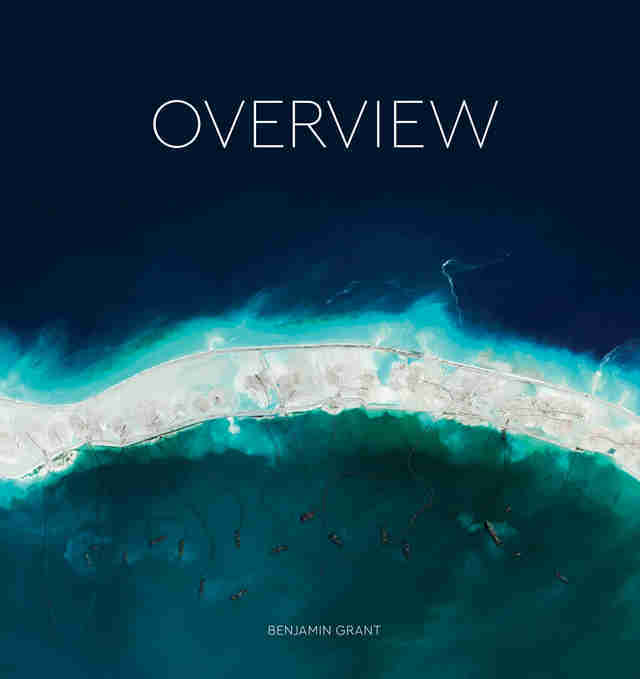 It's precisely this effect that Benjamin Grant tries to capture in Overview, a collection of high-resolution satellite images from a company called DigitalGlobe. Each of Grant's photos, painstakingly pieced together from multiple images, conveys that International Space Station view of the planet. We got a preview of some of the spectacular pictures in this book, and Grant gave us insights on what the pictures mean to him. 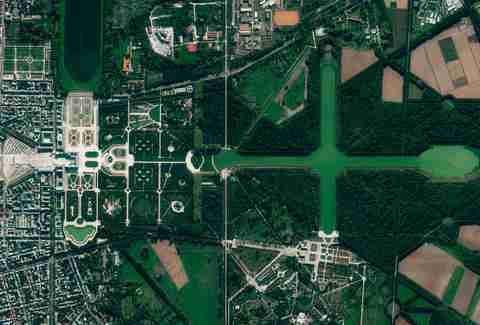 Images copyright 2016 by DigitalGlobe, Inc. The first thing that comes to mind is seeing the architectural angle that may be familiar to us. 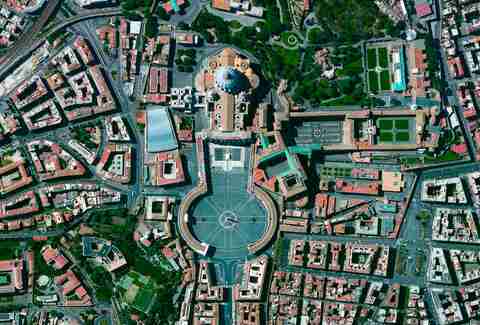 For example, many cathedrals or churches are shaped like a crucifix. To see what that looks like, and understand the architectural decisions better, is important. A lot of Rome has that orange-reddish rooftop color, and it's cool to see from that perspective. In the book, Mecca is on the opposite page from St. Peter's, which is an interesting juxtaposition to put next to teach other. 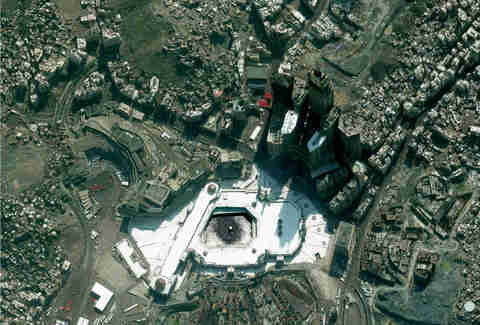 It’s cool to see the holiest sites of two of the world’s largest religions, and I hope people could see that. The book enabled me to create these conversations in a way you couldn't on Instagram. 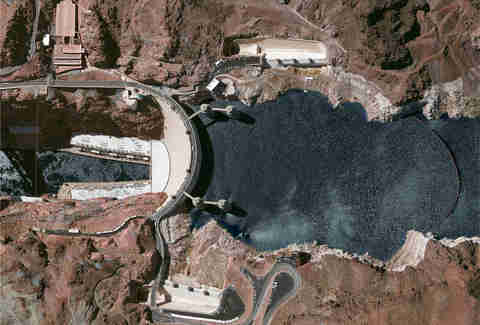 Seeing a dam from this angle makes it easier to understand or grasp how astronomically big these things are, and the number of people it takes to build such a thing. And it’s a popular travel destination that people like to photograph and visit, but it has a very practical purpose as well, and how important it is to power our society. Palmanova is particularly fascinating: It was constructed so long ago, the people building it couldn't have known how perfect it would look from above. Its construction was a defensive measure; if your city was being attacked from any side, you could shoot at them from behind from any of the star courts. 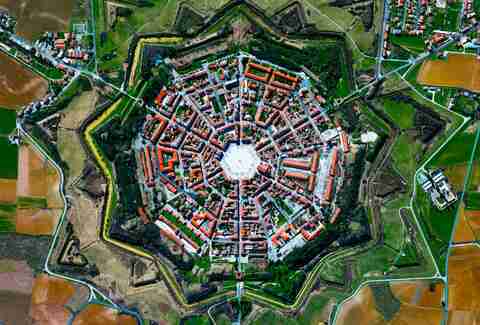 The only problem, from a city-planning perspective, is you can’t expand past those walls. Probably why most cities aren’t constructed that way. 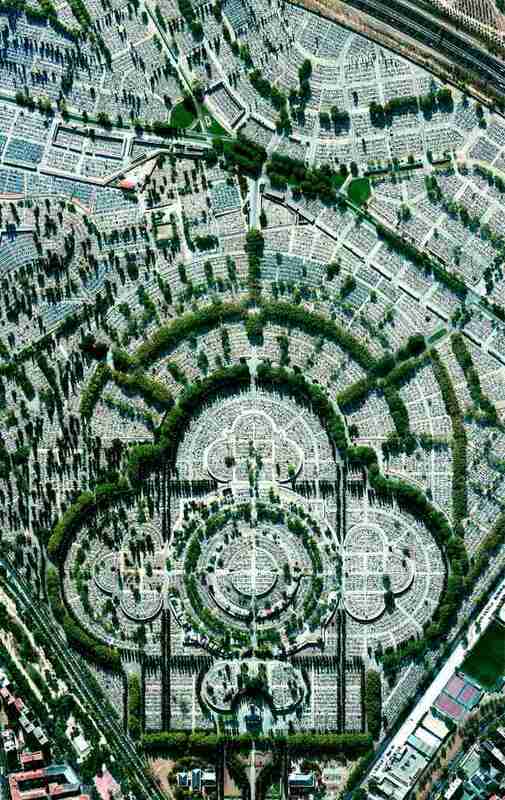 The numbers are stunning: 4 million graves in the cemetery, which is more than the current population of Madrid. It’s a reminder of the passage of time, and that we dedicate a lot of land to burying our fellow humans. 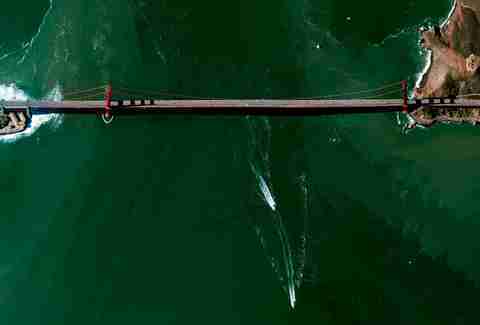 To be able to observe that and see what a grand scale that takes on is something I wanted to emphasize. To see what this many people looks like is much easier to notice when they’re living in tents. 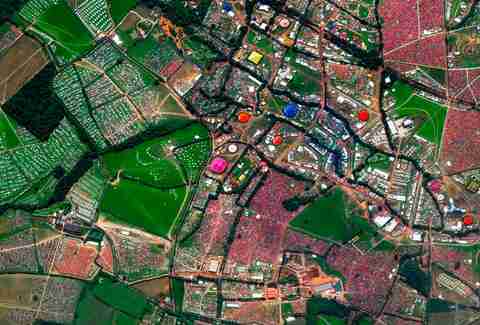 The specks you see here are the tents people camp out in when they’re at Glastonbury. It shows the great celebrations we have as humans where we unite over pieces of art. The bridge was painted orange to enhance visibility in fog. There are no other bridges like it, so unique and recognizable. I love that you can see it in a different way, and take something that’s familiar, and be able to present it in a way you couldn’t have imagined what it looked like from so far away. This image harkens back to a time that doesn’t exist anymore. People don't live like this anymore -- the splendor and the beauty created out of that wealth is why people go to Versailles. The planning, the maintenance, and the design is what I wanted to emphasize here. You can even see the grand canal, and what a magnificent place it is, how it stretches out for acres behind the palace itself. This image is almost bizarre, like something that could be a miniature until you realize just how enormous it is. People have varying opinions of what this means, and if something like this needs to be constructed. From an architectural perspective it’s such a unique, striking building. From this angle you just wonder what it must be like to live there, how the lack of trees must be suffocating, and what it must be like to be surrounded like that. It provides perspective for people who live in less dense, more lush areas, how lucky they are to have that. 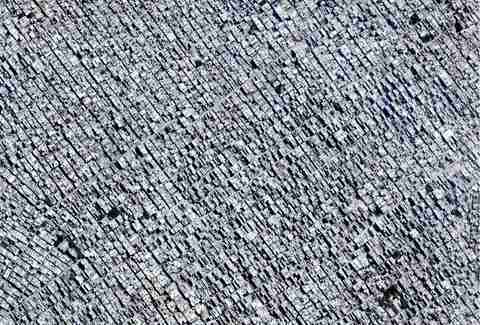 The image exists to show what real, real density looks like, and try to convey what it must be like to live there. When I discovered that image for the first time, it helped me realize how much potential there is in these images. 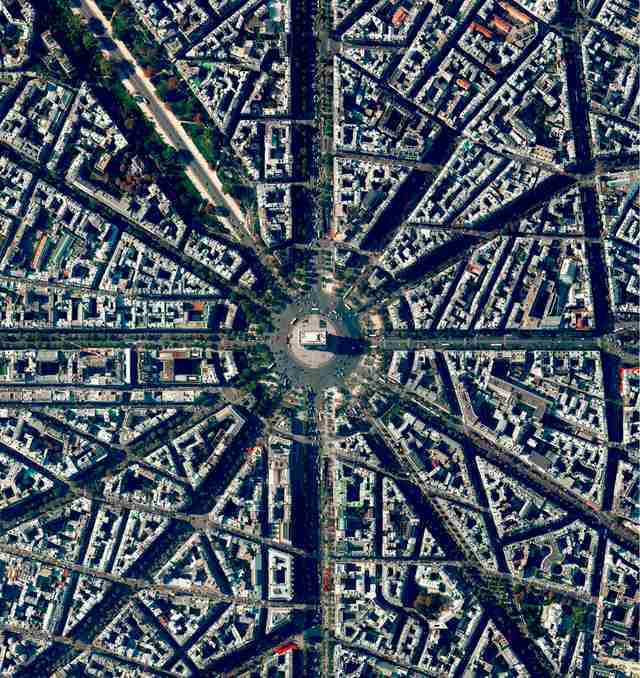 The layout and urban planning you see from above, like the spokes of a wheel, is so amazing to look at. It’s definitely one of my favorite images in the book. It starts the conversation about how we need to have cities that are well-designed. 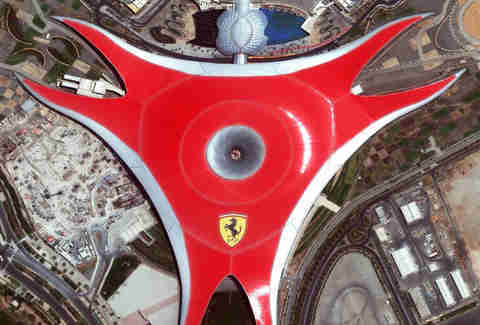 This is on my list of places to go, in the top 10. I am absolutely fascinated by the architecture and the structure. To think this was constructed centuries ago, and they were able to get such balance and structure, is just amazing. It piques my interest to get out there and explore the endless possibility of the world around us. Images reprinted with permission from Overview by Benjamin Grant, copyright (c) 2016. Published by Amphoto Books, a division of Penguin Random House, Inc. 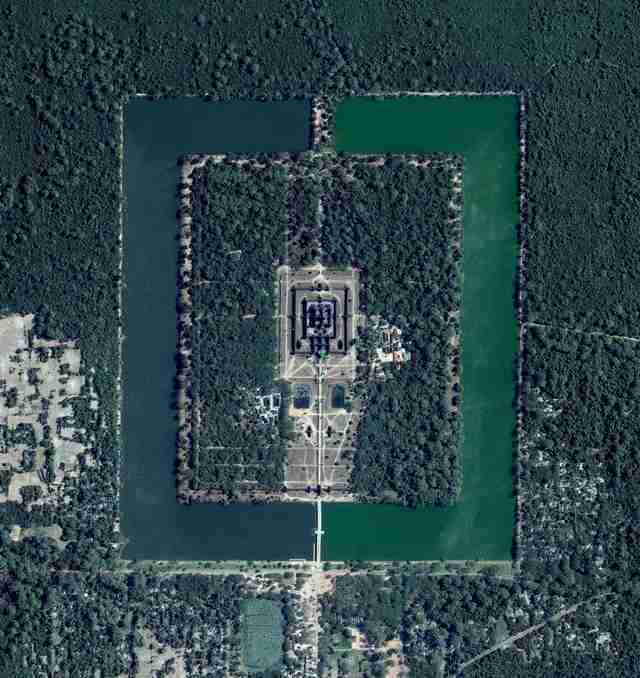 Images (c) 2016 by DigitalGlobe, Inc.
Matt Meltzer is a staff writer with Thrillist. See his very eye-level photos on Instagram @meltrez1.